The world is now in festive mood. World Cup football is going on in Russia. People are either on the ground or in front of their TV sets, monitors or watching the games in mobile handsets. No, not that everybody is fond of football but most of the peoples are football fans. That is why world cup football is considered as the greatest show on earth. So a large number of people are now extremely busy with the game itself. Yet the July issue of Our Poetry Archive is to be published rightly on time. 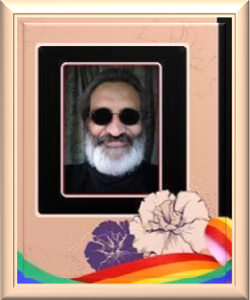 We consider ourselves fortunate enough, that amidst this festive mood all around the globe, poets are still very keen to publish their creative brilliances in the web journals like OPA. 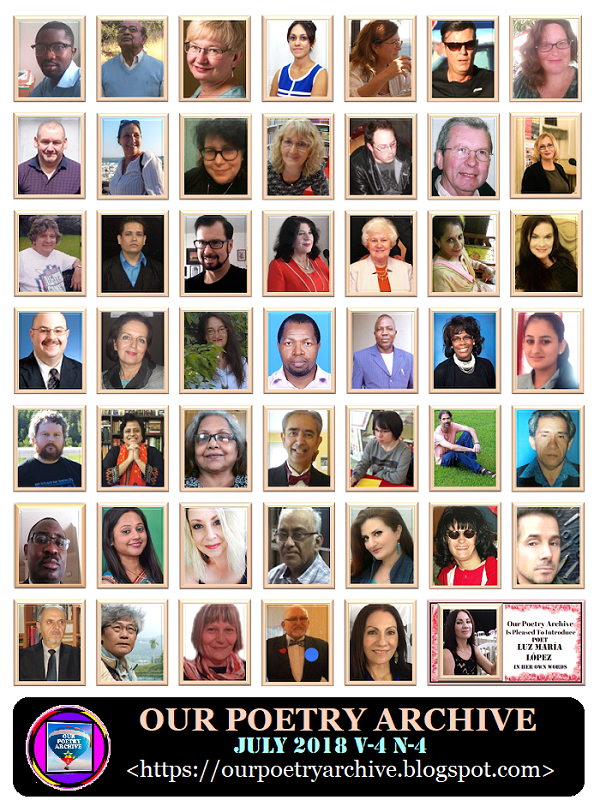 Yes, yet again we are publishing poems of forty seven poets from all over the world in this July edition of Our Poetry Archive. This month we are pleased to introduce a number of new poets to our regular readers. 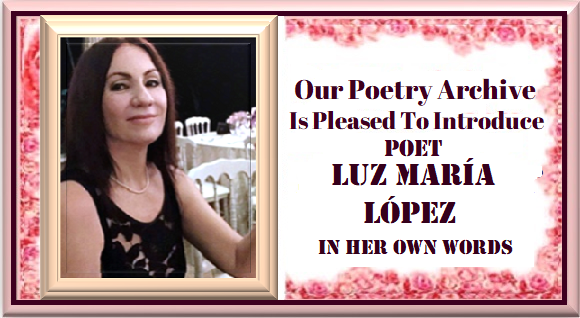 We are also overjoyed to introduce poetess Luz Maria Lopez of Puerto Rico as the “Poet of the Month”. Readers will find her beautiful poems along with an exclusive interview of the poet covering her own poetical world and in-depth discussions on the present world literature with our distinguished interview panel. Poet Aprilia Zank of Deutschland, Alicja Kuberska of Poland, Deborah Brooks Langford of US, Leyla Isik of Turkey and Maria Miraglia of Italy have participated in this lively discussion with our Poet of the Month Luz Maria Lopez. OPA remain obliged to each of them. We hope our readers will also find this interview really worthwhile to spend their time with, along with the collections of poems of other distinguished poets from different parts of the world. In spite of our constant effort to provide our readers with quality materials, it is really a difficult task to maintain the high standard of literary brilliance with every publication. Yet our effort will remain relentless in all the upcoming issues to maintain the literary quality. We therefore request our regular contributors to send us only their best creative excellences so that in the mind of our readers their poems will reign supreme. It’ll also make their poetry more famous worldwide. Actually poetry brings different souls closer to each other. They touch the inner cords of the hearts and can create a symphony of human souls dancing with the tune of the eternity. We at Our Poetry Archive really do believe this from our heart. All our efforts always remain along with this direction only. Yes, we have come along more than three years across this path to bring different cultural traditions and literary heritages more and more close to each other. We hope our mission will pick-up to the next gear in the upcoming years with the constant support and contributions of our poets and readers around the world. Language communicates with people and time, nature and soul. The forms may differ but the essence remains the same and powerful if the creator can express his or her talent with proper dignity and elegance. And poetry is one of the best medium for this purpose. The primary obligation of a poet is to communicate with her inner self. To broaden the canvas of his or her vision as well as feelings for both the life as a conscious being and people and time in general. Poetry is born If and only if one can achieve this. Some would like to argue about this primary obligation of a poet, saying that the true goal of poetry or literature or any form of art in general is to save mankind from the demons of ego, pride and the greed to rule over others to gain more and more power. We wouldn’t like to argue with their views with counter arguments, but what we would try to emphasize is that one can go forward to fulfill these obligations only when one can establish a self identity communicating with his or her inner self. To establish this self-identity is really vital especially for a poet if he or she really wants to communicate with a wider audience across geographical locations and time. Only then he or she can make an impression in literary history without which nobody can fulfill that true obligation of an artist – that of saving mankind as many people demand from a poet. And this establishing of self-identity is actually spiritual in essence. Where, the poet can find himself within his inner soul as well as along with the Universal Soul. Yes both in tandem. We can call this the spiritual cultivating of poetry. Keeping in mind, this July we are also pleased to announce in advance to our readers, that this year also Our Poetry Archive is bringing another grand Anthology like all the previous years. This time we’ll publish OPA Anthology Of Spiritual Poetry-‘Beyond Borders’. Our readers are well aware that we have already published three Anthologies in the first three years of our web publishing. We have published OPA Anthology of Peace Poetry Against Terrorism. Which was followed by OPA Anthology of Poetry Against Racism. And last year we have published OPA Anthology of Contemporary Women Poets. So we thought that this time we can work on spirituality to extend our knowledge and experiences about life eternal and even beyond the known world in accordance with the Universal Soul. To our surprise a large number of poets around the world both known and previously unknown to us had participated in this Anthology with lot of enthusiasm. We hope like the previous Anthologies this upcoming one will also win our readers’ attention greatly. LUZ MARÍA LÓPEZ: Everything that exists is a form of poesy. Poetry is by far beauty, evolution, revolution, transformation, sublimation and healing source. LUZ MARÍA LÓPEZ: Poetry is a revolutionary force. Guards the spiritual, moral and social responsibilities that seek universal brotherhood, justice where there is abuse, peace where there is confrontation, love where there is hatred, beauty where there is dreariness. Gabriel Celaya believed that poetry is a weapon loaded with future. It certainly carries on its shoulders all the struggles and victories of our people. For poetry urges change, renewal, cultural bliss and humanistic wisdom. Also, poetry touches all souls. Transformation is a poetic deed. LUZ MARÍA LÓPEZ: It never is a plan. Poetry comes to me at any moment and I must grab it then or it flies away into another direction. I write – nonstop - until I feel I have reached the full force of it. If not, I leave it dormant. Afterwards I read it all, edit the less possible. LUZ MARÍA LÓPEZ: Yes. Lucid dream! LUZ MARÍA LÓPEZ: Lately are the social issues, women’s issues, children’s issues, that have more weight into my writing. For I have a responsibility as a poet, I do take very seriously the silenced voices and try to convey all possible mirrors to seek a response from this estrangement that is killing our sense of empathy and justice. LUZ MARÍA LÓPEZ: Love! Or was it a mystic trance? LUZ MARÍA LÓPEZ: I was always a poet at heart. For why I would fetch little orphaned birds from fallen nests and take home with me? Therefore, poetry awakened in me at an early age. I believe that we all have that soul binding force within us. LUZ MARÍA LÓPEZ: I read to a friend that believes in poetry and because this soul has greater sensibility as to trust that poetry is an act of loving oneself and others, and poems are sublimated cosmos and fractal mirrors too. LUZ MARÍA LÓPEZ: Yes, I have published anthologies in English and Spanish. The first time to clasp it in my hands is a very emotional moment, like holding a “colibrí” (humming bird). LUZ MARÍA LÓPEZ: I prefer to read poets that are giving all their spirit and mind for the true nature of poetry. LUZ MARÍA LÓPEZ: A poem is always to be read with soul and mind and while it requires deciphering the poet’s intention and message, it shall never be a mystery undiscovered. More, like a communion, where the reader also attaches strings to itself, relates to those feelings, see things that were not intended originally in the poem, gives a new dimension to it, because each one reads according to own history of life and perspectives. Meaning and Transparency are qualities that shall be balanced. LUZ MARÍA LÓPEZ: Lately, I am writing more about social issues, but also eco-poetry and soul binding emotions (spiritual), salt poetry (a challenge). But yes, I consider each poem unique in essence, even if the theme is a recurrent one, like “love”. LUZ MARÍA LÓPEZ: Poetry is soul, not genre. One could say however that there are instances in which feminine and masculine seem to be two ways into poetry, still I feel as oneness, not totally differentiated. LUZ MARÍA LÓPEZ: I hardly write about myself, even if I write as if about myself. Feelings are inherent to anyone and all, like mirror neurons, like echoes in the brain and skin. And yes, I do keep wide open eyes and ears to worldwide issues and react and act upon it, hoping for empathy and possibly change. LUZ MARÍA LÓPEZ: Poetry is not an ego trip; otherwise it is an act of profanation. Poetry is pure and serves causes. Not individualistic agendas. LUZ MARÍA LÓPEZ: We get hit by an image, be it visual, tactile, dreamy, a memory, a feeling, any image! It is the entryway into a poem, the sphere of the senses and emotions with which the poet will get all entangled. A poem is largely a flow of images dancing before the eyes (mind). It finishes when we feel that we have gotten past the momentum into its closure. But that is perhaps the mechanical part, for we are still pulsing. 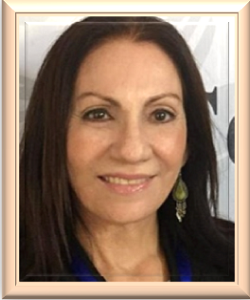 LUZ MARÍA LÓPEZ: Actually, there is a trend of activism, poetry that denounces and claims spaces of justice and reformation, a poetry to awaken the nation and subvert all inconformity into actions. But truly is not new, for Puerto Rico has a history of scholarly poets fighting a cause: liberty and the rooting of own traditions and cultural heritage before the foreign imposition. Puerto Ricans are defined by a complex history. There is not singular Puerto Rican standpoint or character. We are a million things. But we are poets; an armed force of poetry dating back to the Aboriginal times (before Columbus). And it is a rich and diverse. LUZ MARÍA LÓPEZ: A good poet does not write poetry to gain any recognition. A good poet writes out of own pain, own pulses, writes to convey significance, to awaken consciences, souls, skins and also to sublimated the word into the most beautiful form of speech. LUZ MARÍA LÓPEZ: “Fill the paper with the breathing of your heart.” - William Wordsworth. That is a hard question to answer for there are poets that have become the universal essence of the truest meaning of poetry. Poets that we shall read if we consider ourselves poets, like Whitman, Neruda, Keats, Sor Juana, Julia de Burgos, Khayyam, to mention a few, and there are the contemporary poets whose contribution is not only beautiful but influential in terms of filling the paper with what is vital and undying. Those are the properties. LUZ MARÍA LÓPEZ: The momentum, the thunder that drives the hand to the paper. Then, imagery is a collision of all possible VISIONS humming around the triggering force behind the poem. Each poem holds a unique imagery inherent to it, so to say. But in poetry, all senses are connected pathways. LUZ MARÍA LÓPEZ: A flowing mood! Don’t feel the same way every time I write a poem. It makes me feel inwards and outwards towards something bigger than my own frame of mind, a boomerang effect where I get hit back and strike others too. LUZ MARÍA LÓPEZ: So many times while speaking to myself, I am really speaking to others, even if it sounds contradictory. I am sure you all understand that. But most of the time is to others that I speak, to those that can find themselves and others in those words, and maybe, and hopefully something happens too! Like activism against violence, compassion, mindfulness, understanding. DEBORAH BROOKS LANGFORD: What is the message of your poetry? What messages does your poetry convey? LUZ MARÍA LÓPEZ: One message that I never convey in my poetry is hate. All the others are sheltered in the Luz’s realm of poetic emotions and goodness of heart. LUZ MARÍA LÓPEZ: The success, whatever success, is tied to my writing style and the sense of poetry significance that I might have conveyed. However, never to underestimate the power of internet and social media as tools to relate to others in this poetic universe, where everything convenes, collides, diffuses and gets forgotten too. I write not because of gratification with “success”. It is an act of my own soul who has reasons to relate to others, be the others, in this universe needed of incommensurable healing. LUZ MARÍA LÓPEZ: OPA is a vital and reliable web journal. Here we can meet the best contemporary poets of the world, being certain of its commitment to quality, fostering diverse cultures and languages and poetic friendships as well. as broken as the word “P E A C E”! Where do all the tortured innocents rest after all? another history book so we remember wars? The cold stare of those that kill them to gain power? you will plant flowers over the sores of blood! for a bird is about to die! *bacha posh – dressed up and disguised as a boy. Refers to a cultural practice in which a daughter is sent off into the world as one of the boys. LUZ MARÍA LÓPEZ is a published poet, narrator, editor in chief, translator and cultural promoter from Puerto Rico- Caribbean. 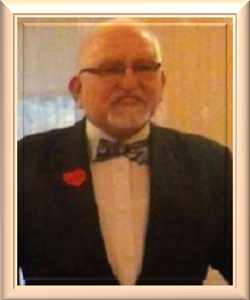 Is Continental Executive Director for World Festival of Poetry (WFP) and World Poetic Front for Defending Women’s Rights (WM). Is recipient of the Kathak Literary Award 2017 – Dhaka International Poets Summit (Bangladesh).